Welcome to the online home for photographer Royce Howland. Thanks for stopping by! I hope you find something... vivid! Today I'm announcing dates for a new Winter Photography Tour in David Thompson Country and the Canadian Rockies, based at the wonderful Aurum Lodge. Winter in the Rockies is a very unique time to visit and photograph. During this season, the land is revealed with special, stark beauty, emphasized by clear air, snow & ice, and winter mountain light. This tour provides an intensive focus on field photography, the confidence of an event lead by experienced photo guides, the camaraderie of a small group of like-minded photography enthusiasts, and an array of world-class winter photography opportunities. For more information, see the tour description page at the Vivid Aspect Photography blog. If you have any questions, as always please feel free to contact me. I have announced dates for the ever-popular Fall Photography Tour in David Thompson Country and the Canadian Rockies. Fall in the Rockies is a popular time, with beautiful scenes to be found in practically every direction. It can also be highly productive -- as well as fun! -- to join a small-group, field-intensive photo tour. If you would like to explore a fantastic autumn setting with your camera, round out your Fall plans with a few days in this spectacular region! For more information, see the tour description page at the Vivid Aspect Photography blog. If you have any questions, please feel free to contact me. You're a photographer looking to make a significant commitment to creative growth. You’ve come to realize that the most exciting frontier isn’t new gear, digital processing techniques or getting votes on social media. Instead, your real goal is creative expression, and these other things are just means to an end — visual storytelling. The Cypress Hills region of southeast Alberta and southwest Saskatchewan is a unique and wonderful area. In the midst of vast prairies, the Cypress Hills offers grasslands, forests, lakes and rolling terrain. At night, a canopy of stars against a backdrop of black provides a brilliant light show all its own. This is a distinctive place of understated beauty and long history. Together with my colleague Peter Carroll, I will co-lead a small group of enthusiastic photographers on a masterclass in the beautiful Cypress Hills. We'll be based at Historic Reesor Ranch, a working ranch run for 5 generations by the Reesor family whom we will meet during the event. Can you picture yourself learning and photographing during a visual storytelling experience in the early Fall of 2014? If the answer is yes, join us for Storytelling in the Cypress Hills! Now open for registration. For more information, see the tour description page at the Vivid Aspect Photography blog. If you have any questions, please contact either Peter or me. We'd be happy to provide details and answer any questions to help you decide if this is the right event for you. Can you picture yourself creating photographs in a wild and beautiful land, under amazing summer light? In June of 2014, I'll be partnering once again with Tim Vollmer on an exciting return to Iceland. For 12 days, we will lead a small group of photographers to amazing locations across Western & Southern Iceland. My trips to Iceland in 2012 & 2013 were incredible, and in 2014 the experience should be no less amazing. If long days of summer light in a breath-taking land with a group of like-minded folks sounds good to you, check out our Icelandic Summer Light photo tour in 2014! For more information, see the main announcement posted at my blog. If you have any questions, please contact either Tim or myself for more information. We'd be happy to tell you more about travel, accommodations, logistics, what gear to bring, or registration details. We hope to see you in Iceland next summer! More exciting exhibit news! 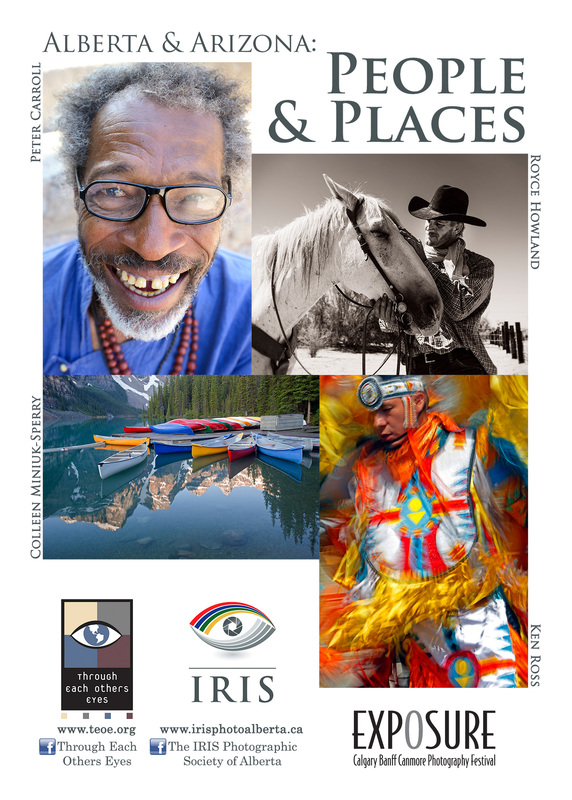 I’m pleased to announce that Peter Carroll and I will have an exhibit of photography from the recent international photography exchange project we did in conjunction with Arizona team mates Ken Ross and Colleen Miniuk-Sperry. The event will run in Calgary February 1 - 28 across multiple branches of the Calgary Public Library, as well as February 21 - March 8 at St. Mary's University College. In addition to the photography displays, there are various presentations and receptions where visitors can meet the photographers behind the project. For more information, see my blog post. If you're in the Calgary area over the coming weeks, I hope you can make it to one or more of these events! My new photograph Icy Breath Of the Frost Dragon was selected as the cover image for January, 2011 at NatureScapes.Net. This seems like a great reason to make this my first featured print of 2011! The Sun Is Shining But the Ice Is Slippery is one of my most popular images, and a personal favorite. In addition to the framed or un-framed prints available through Fine Art America, I am featuring it to launch a new series of specially selected photo prints on metal. The metal print version is approximately 21.5 x 16 x 1.5 inches in size, and is a deep, luminous, high-gloss print on polished sheet aluminum. Durable, light and ready to hang on gallery-grade aluminum framing, each print comes in a heavy shipping crate. This form of metal print presents a stunning visual experience, extremely well matched with my style of photography. Gleaming tones, vivid colors and incredible details make for an experience that is the next best thing to being there. Priced at $895.00 US (not including shipping), a metal print of The Sun Is Shining But the Ice Is Slippery is a distinctive artwork to display in your home or office. Please contact me for further details. When I go on photography trips to the David Thompson Country area -- which is far less frequently than I would like! -- there is really only one place I like to stay: Aurum Lodge. Hosts Madeleine and Alan Ernst have created a unique facility, one that is both comfortably homey and ecologically sustainable in many ways. Nestled in the trees on a hill overlooking Abraham Lake, the main lodge boasts several guest rooms with B&B-style service in the common area. There are also several self-contained units with their own kitchens for those who would like to be more self-sufficient. But in the latter case, you must bring your own supplies because the nearest grocery store is not close! Madeleine and Alan are gracious hosts. And they know the needs of photographers. They can help with knowledge about locations and conditions, as well as food planning (in the main lodge) and even guiding. Indeed, Alan is an accomplished photographer in his own right with a keen eye and a particular appreciation for intimate compositions. Photographically, the area is rich in potential at virtually any time of year. And photography is a key way to spend your time, because the purpose of Aurum Lodge is not for people who want to sit inside watching TV or surfing the Internet -- the lodge isn't on the main power grid, there's no cable and no high-speed access. So get outside and enjoy! Highly recommended.